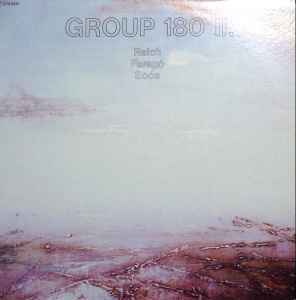 Group 180, Reich*, Faragó*, Soós* ‎– Il. "Piano Phase" composed 1967 for two pianos. "A Pók Halála + Sírfelirat" (Death Of The Spider + Epitaph) composed 1983. Recorded live 26th to 30th March 1985 in the Hungaroton Studio. Includes an A4 foldout sheet with liner notes in Hungarian, English and German. Matrix / Runout (Side A runout, stamped): SLPX 12799-A I. P. A.T.
Matrix / Runout (Side B runout, stamped): SLPX 12799-B I. P. A.T.